I have been playing ARK: Survival Evolved for some time now and have recently decided to do my second attempt at the Peles Mansion. My initial attempt building this mansion was done offline on my own ARK server and a update to the Castle Mod I was using caused me to loose the entire mansion. I abandoned my plans at building this mansion as I wasn’t prepared to spend the time again in doing this. I have however decided to attempt this build again with the vanilla structure panels available in the game. I have started creating the floor plan as to get an idea of where things will be and where I must build walls and different structures. I have downloaded the floor plans from HERE. 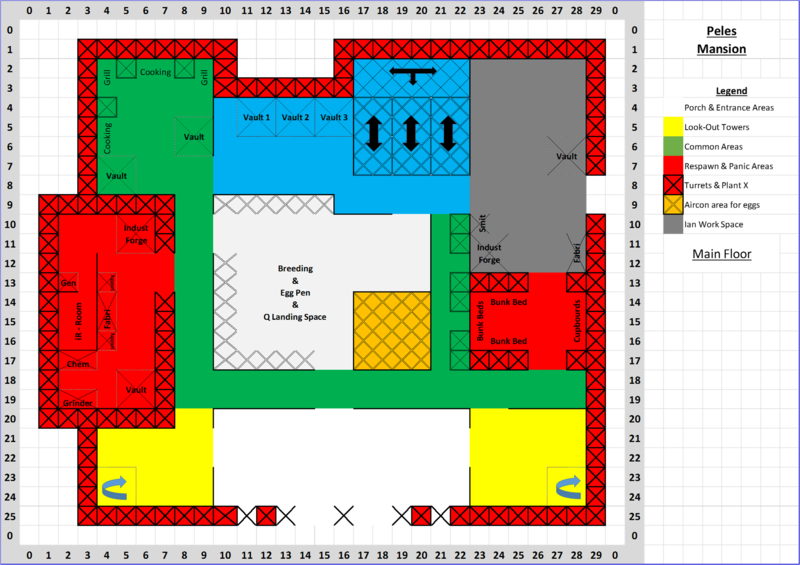 After I have downloaded the main idea of the floor layout I have started laying out where I would like the different areas in my place. For the time I have only concentrated my attention on the Main Floor and a rough draft of the Second floor. STAGE 2: Here is some pictures of the house.